Come on, You can Truss (t) Me! Denny Jump (Bellevue, WA, United States) on 15 March 2012 in Abstract & Conceptual. A rather close examination of the elaborate trusswork on the south end of the Golden Gate Bridge. This wonderful bridge was constructed with steel from Bethelhem Steel Company, Bethlehem, PA . Construction on the bridge began in Feb, 1933 and completed in May, 1937. Cool, that is something I would like to see with my own eyes. I always think that, in Nature, the closer we look the more beauty there is to be found. Might not be the same with bridges ! Always fascinated by engineering skills, I love the golden light that you have found. That was, and still is, impressive ! Great study in lines, light, and color, Denny. This makes a nice industrial abstract. Ha - clever title, Denny! This makes for a fantastic abstract - I just love all the lines cris-crossing like organized chaos. Great eye! intriguing details for sure! this is definitely one of the modern marvels of the world, i thing, both for its dimensions and for its location. but steel from PA? was that a long ways away? just think of the logistics of transporting it across the continent ... amazing !! An excellent view of the engineering and hard working juju that creates these iconic and very important structures. Wonderful share, Denny. Great shot to show the bridge support beams, and I love the title! Great frame of all the impressive frame work, beautiful golden color...a very attractive photo Denny! Wonderful closeup shot, Denny, and I'm just happy you're not a bridge painter; I would worry about you! Bridge and dam construction is such dangerous work. At least today we have better safety measures. ahhhh reminds me of the Forth Rail Bridge from my homecountry! Nice shot! Beautiful image! It makes a wonderful pattern. Amazing to think that everything was transported across country from Bethlehem Steel. Since I lived near and worked at the Presidio, I spent a lot of time viewing the bridge and it was a view I never tired of. @Elaine Hancock: Thanks so much, ELaine - I love visiting the Presidio - our son and his family live in the outer Richmond District so they are right between the Presidio and Golden Gate Park..a great location really for that. The bridge is truly one that I never tire of seeing either - you are so right! Cheers - Love your images for today and yesterday! Wonderful Black and White compositions!! 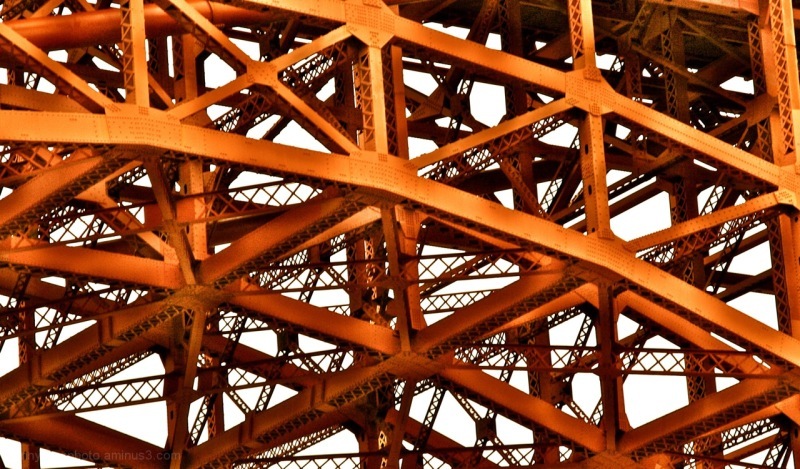 Actually, I like the patterns in the girders and the warm light on them is lovely.